Erasable Memo Boards are an effective and reasonably-priced way to keep the name of your company or organization in front of customers. Also, they're great promotional giveaways because they provide a functional benefit to the recipient while offering continual exposure to your imprinted marketing message. 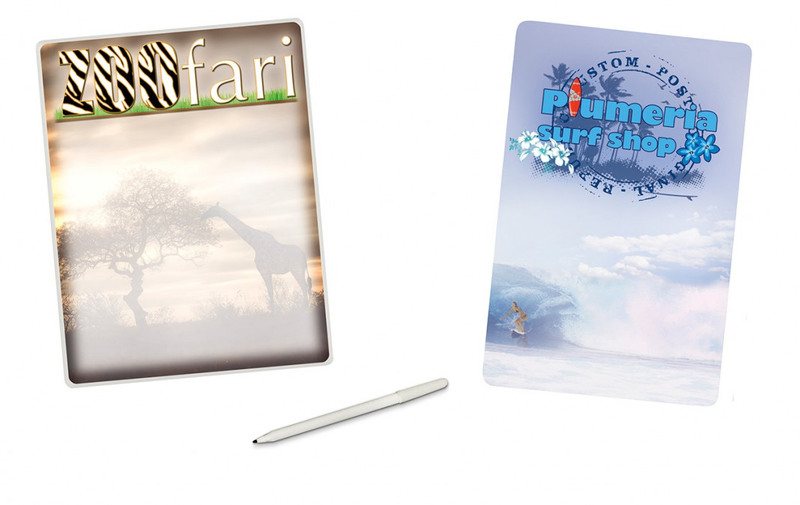 Because they are custom printed, your memo board may contain any design elements you choose - logos, marketing messages, photos, calendars, schedules, lists or any other promotional artwork. If used for fund raising purposes, memo boards can even include printed advertisements. Formax memo boards are available as Dry Erase or Damp Erase. Also, the pens can be easily affixed to the boards with a clip, or left loose if you prefer. In addition, our memo boards can be created with magnets on the back (for adhering to steel surfaces such as file cabinets and refrigerators) or they can be made with foam tape on the back (for attaching to walls and other surfaces). The most frequently ordered memo board sizes are 8.5" x 11" and 5.5" x 8.5", but we offer custom sizes as well.